Saturday - Christmas Eve! We will have a light supper before church and then a bunch of different appetizers and treats when we get home. We are also eating lots of treats. We did a second round of gingerbread and sugar cookies. This time E helped me decorate them. 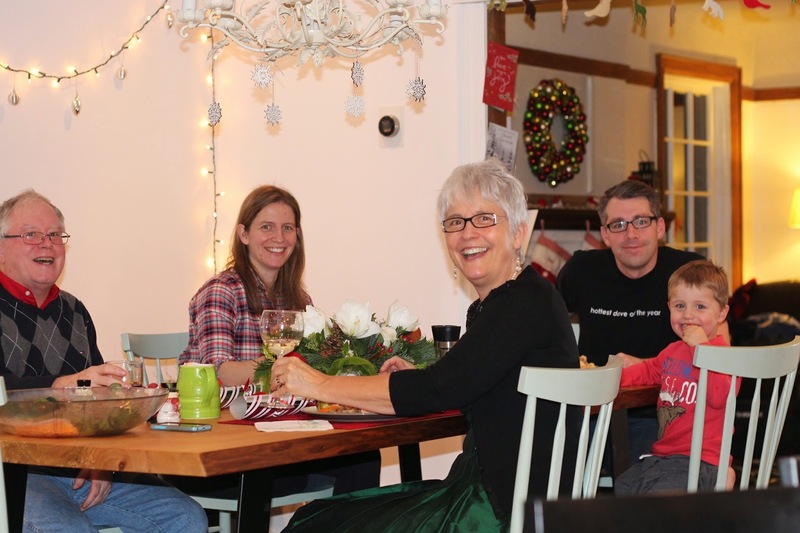 As always, reminiscing about Christmases past with people that are no longer with us, or with people we don't get to see often. I am lucky that I really only have good memories of Christmas and it is a happy time for me. I do get sentimental about memories though. On Sunday at church while our music director, Douglas, was playing the intro, E wanted to go over and watch him play the piano, which was fine of course. I thought about how he would have loved to watch my Papa (also named Doug!) 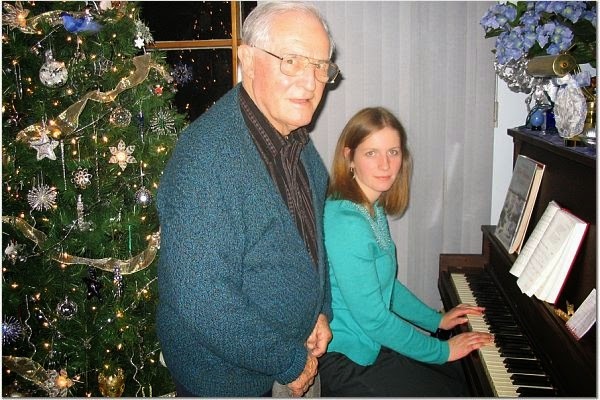 play the piano, and how much Papa would have been glad to have him there, but Papa died when E was only a few months' old. Receiving Christmas cards in the mail. I love sending them and I think people like getting them even if they themselves don't send them. Here is our card for this year. Enjoying all things winter and Christmas. Because we have our Christmas party on the second weekend of December, it means our decorating and baking are complete early on and we can coast into Christmas Day. We have been lucky to have some snow so E can go sledding, and I'd like to take him skating this afternoon if I can. After Christmas when everyone takes down their lights. I love seeing the bright coloured lights in the neighbourhood and when I'm driving in the evenings. It makes the cold weather seem bearable. Planning our menu for when my parents are here. I like to have special foods while trying to accommodate everyone's tastes and preferences. I like making new things but also want to keep it simple and traditional. Christmas morning. E is a happy and excited kid on most days, but when I think of Christmas morning, the joy in this kid is going to be over the top, and I can't wait! 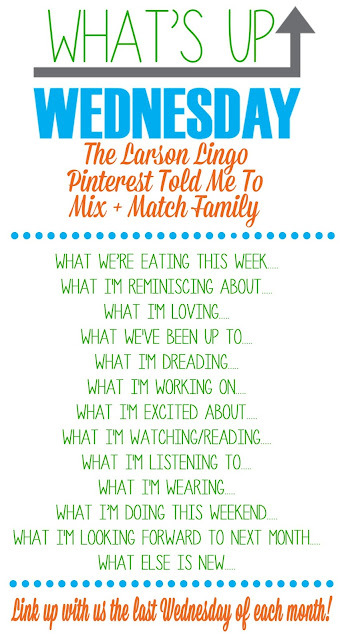 We watched A Muppet's Christmas Carol on the weekend, I'm watching the Jamie Oliver and Gordon Ramsay holiday cooking specials I kept from last year, and we still need to watch Elf, the Polar Express, The Holiday, and some others. 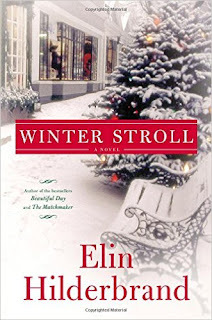 I am reading Winter Stroll by Elin Hilderbrand, I read Winter Street last year. I had forgotten the family's name is Quinn. Lots of Christmas carols. I love that we can just put on a playlist and hear so many different songs. No full length shot, but you can get an idea of my top and necklace. Skiing. E's lessons start next month on Saturday mornings. Since the daycare doesn't take kids younger than 6 months old, then Dave and I will take turns skiing while E is at his lesson. I am also looking forward to being cozy in the lodge with Q when it is not my turn to ski. Yesterday was E's Christmas concert at school. His class sang two songs in French and then all of the JK and SK classes sang a song in English together. It has been cute listening to him practice the songs at home, just a line here and there, with sometimes questionable pronunciation, but it always comes together for the concert, and the kids had so much fun. His teacher invited us to the classroom for a sneak peak and I got some good photos and video. This is an easy one, the arrival of our son. We are so happy to have him in our lives and he is a true joy to us. Linking up with Shay, Sheaffer and Mel. Everything is just adorable! And I envy all that fluffy white snow you have for Christmas! That black tulle skirt and the red plaid shirt is brilliant!! Love!